The Teen Center provides youth ages 13 through 18 a safe and exciting place to go after school. 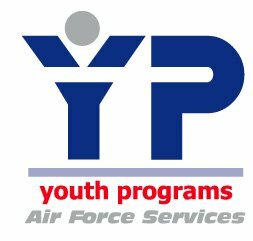 It is affiliated with the Boys & Girls Club of America and offers many of the BGCA programs, as well as Air Force programs too. Programs such as the Cooking Club, the School of Music, the Photography Club, Robotics, the Keystone Club which includes Leadership skills, College Trips and Community Service. Take advantage of the Teen Center Field Trips and Summer Camps, as well as Winter Camps, to places like Big Bear, Mammoth, Magic Mountain, Fright Fest, Snowboarding, etc.… The Teen Center also offers, the Teen Center Snack Bar, Youth of the Month, Youth of the Year, the Drama Club, the Art Club, a Fashion Design Club, many different Gaming Systems, a Computer Lab, the Homework Room, a Pool Table, Ping Pong, Big Screen TV, and of course a great staff! Lessons available for Piano, Guitar, Bass Guitar, Drums, Flute, Clarinet, Saxophone, Trumpet, and Voice. Other instruments available upon request. Lessons available at all levels, Beginner-Advanced. For prices and class schedule, stop by the Teen Center or Youth Center. The ESM is located in Building 7211, right next to the Teen Center. Cost is $360 for an annual membership or $5 a day for a daily membership. One of the worst times for a teen to make bad decisions is between the hours of 3 pm and 6 pm. For a dollar a day you can have peace of mind knowing that your son or daughter is in a safe, fun and developmental environment with a caring staff that will make sure your son or daughter feels right at home and have a great experience. Members are also eligible for discounted prices for field trips and summer camps. 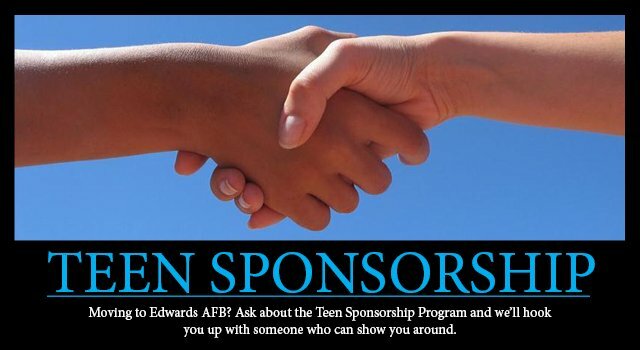 Teen Sponsorship is available for teens that will be moving to Edwards AFB. The Teen Center will partner your teen up with someone of the same age, grade, gender, and with similar interests. Together they will tour the center, the school, the base, so they will have an immediate friend the minute you land. On the other hand, if you happened to be PCS’ing from Edwards, we can help there to. Tell us where you are going and we will contact their Teen Center so your son or daughter can correspond with someone who lives where you’re going. The Congressional Award is the United States Congress’ award for young Americans. It is non-partisan, voluntary, and non-competitive. The program is open to all 14- to 23-year-olds; young people may register when they turn 13 1/2 years old and must complete their activities before their 24th birthday. Participants earn Bronze, Silver and Gold Congressional Award Certificates and Bronze, Silver and Gold Congressional Award Medals. Each level involves setting goals in four program areas; Volunteer Public Service, Personal Development, Physical Fitness, and Expedition/Exploration. Earning the Award is a fun and interesting way to get more involved in something you already enjoy or something you’d like to try for the first time. You move at your own pace – on your own or with your friends. This is not an award for past accomplishments. Instead, you are honored for achieving your own challenging goals after registering for the program. For more information about the Congressional Award see Mr. Paul or Call 275-TEEN. Do you have the right stuff? Are you a true leader, a crusader for community service, a person with a vision for America’s future? Then perhaps you are the next National Youth of the Year. Maybe you are the one to win literally thousands and thousands of dollars in scholarships. If you think you have the right stuff, run, don’t walk to your nearest teen center and inquire within.